Birmingham Small Arms Ltd is one of Great Britain’s best known manufacturers of bicycles, motorcycles and rifles. This Museum is a public database informing the company’s early history with examples of BSA bicycles from the turn of the century until the early 1950s, including military models from WW1 and WW2. Bicycles were not accepted at first as suitable military mounts. The British military establishment was stuck in its ways. After much lobbying by the manufacturers, Cycling magazine and army officers, the Army Cyclist Corps was eventually formed, and the advantages of the cycle in warfare was proven. In 1907, new advertising manager Edward Louis Maxwell came to BSA from Gamages, London’s most successful department store. He’d worked in advertising for 15 years in America and England – the most fascinating time for both the cycle and advertising industry; a time that established both into their current form. Maxwell wrote a book entitled Modern Advertising. 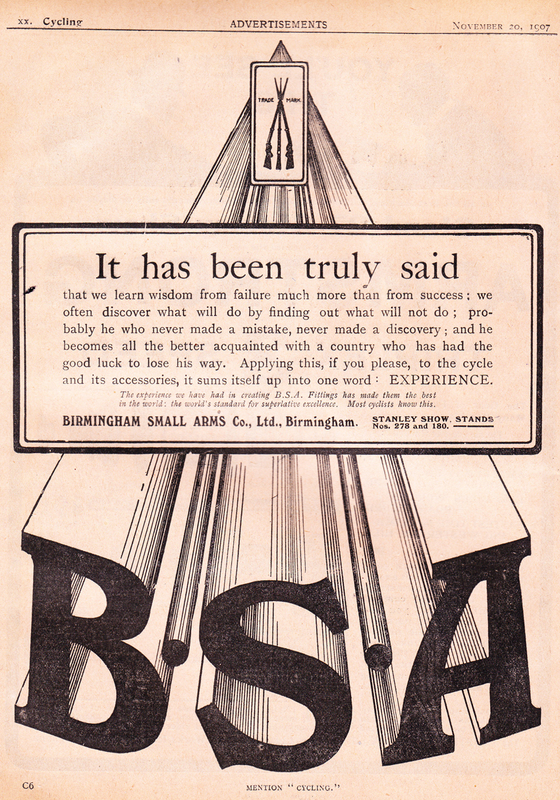 ‘It has been truly said’ was BSA’s copy for the 1907 Stanley Show. BSA supplied military roadsters and folding bicycles in both world wars. 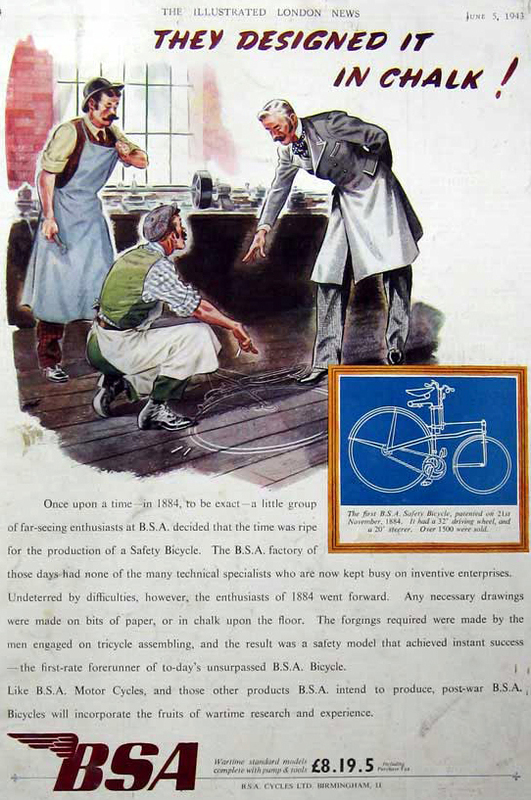 I’ve included information about other manufacturers’ military bicycles to compare with BSA. This website is a brief visual tour of bicycle history, and in particular military bicycle history, seen through the eyes of one of the world’s top manufacturers, BIRMINGHAM SMALL ARMS Co Ltd.
A website is a creative entity that never stops growing. This one started with just my BSA bicycles, but soon developed into a database for military bicycles in general. It may change again. I create these online museums in my spare time, somehow fitting them in between work, parenting and sleep. As I come across more information, I’ll add it. Though this is the ‘information age’ information is not available for everything. Most bicycles are hard to identify, and BSA bicycles are notoriously difficult to date accurately. There are no existing factory records and frame numbers were not sequential. Even the marque enthusiast has little information. I’ve done my best here, but I’m certainly no expert and may have made mistakes. Please phone or email me… If you want to chat. I enjoy meeting fellow collectors and enthusiasts, and make many friends through our hobby. Please do NOT phone to ask me to date your bicycle. Thank you to all who’ve taken the time to contact me with advice, information, pictures and to correct my assumptions. I’d also like to hear from you IF YOU HAVE A PRE-1950 BSA or MILITARY BIKE FOR SALE. The contents are copyright to protect articles and images from third parties. But this is a public service website. All my original content is free for you to use; as a courtesy, please include a link to this website to show its source.